Defending the Judiciary from allegations of overreach, Chief Justice of India T.S. 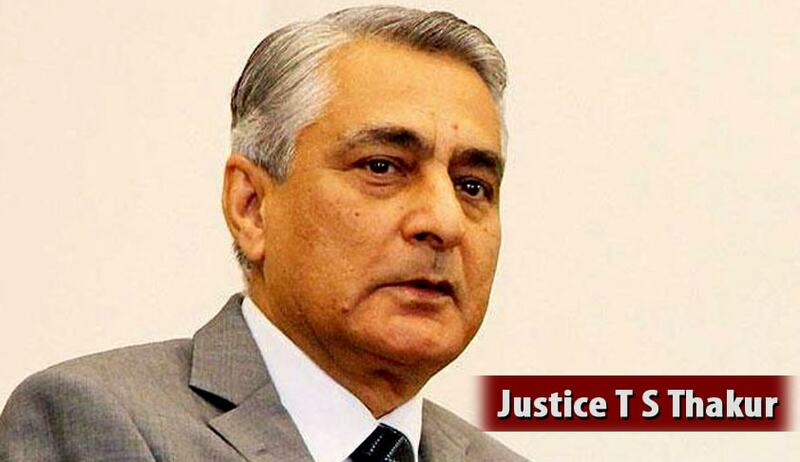 Thakur on Monday said that Judiciary intervenes only when the executive fails in its constitutional duties. In an interview to ETV News Network, the CJI was quoted as saying that if there is neglect and failure on part of government agencies, judiciary will “definitely” play its role. He further expressed concern over the vacancies and stated that if the number of Judges is not increased immediately, the situation may go out of control any time, while the number of litigations would cross over 5 crores in the next 10 years. “I have requested the Prime Minister on several occasions and am sending a report on the same issue to the Centre too,” he was quoted as saying. Mr. Jaitley’s remarks were in connection to the Supreme Court judgment wherein it had issued guidelines for disaster/drought management. “We have the National Disaster Response Fund and the State Disaster Response Fund and now we are being asked to create a third fund. The appropriation bill is being passed. Now outside this appropriation bill, we are being told to create this fund. How will I do that? India’s budget-making is being subject to judicial review,” he had said. You may read the LiveLaw article here.